Carrots are among the most popular vegetables, known for their bright orange hue. distinct shape, and reputation for being one of the healthiest vegetables available. The root vegetable belongs to a genus called daucus carota, and is closely related to parsnips and celery, according to WHFoods.com. While their orange color has become a trademark, carrots actually come in different colored varieties, including purple, yellow, white, and red. Carrots are native to many parts of the world, particularly in Africa, Asia, and Europe — though they can be found almost everywhere. Globally, 40 million tons of carrots are grown every year, with China as the the top producer, accounting for 45 percent of the total crop. In the United States, it is the sixth most-consumed vegetable, with California being the top-producing state. Good carrots are firm, smooth, and brightly colored. Those that are soft and mushy to the touch, and with darkened tops should be avoided, as these are most likely old. Stored properly, the vegetable keeps longer than most. They should be stored in the coolest part of the refrigerator to preserve its nutrients. Carrots are especially known for being a rich source of beta-carotene, which is responsible for their unique color. Indeed, many of the vegetable’s health benefits are centered on this component. 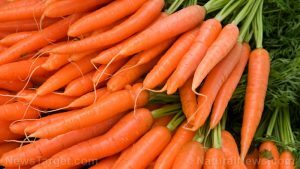 Beta-carotene has been associated with a decreased cancer risk, with some studies finding that just 1.7 to 2.7 milligrams of beta-carotene consumption daily can reduce lung cancer risk by 40 percent, OrganicFacts.net reported. With three milligrams of beta-carotene available in the average carrot, the vegetable is great for cancer prevention. With its fiber content, the vegetable has also been known to reduce colon cancer risk, while some studies show that it can also be beneficial in preventing breast cancer. Beta-carotene also promotes eye health, and is associated with the prevention of macular degeneration and cataracts. It can also split itself to form vitamin A, which improves eyesight and prevents night blindness. Studies have shown a link between carrots and a lower cholesterol level, making carrots a heart-healthy food that can reduce the risk for heart attacks. The potassium in carrots also relaxes the blood vessels and arteries, helping to promote a healthy blood circulation and keep blood pressure at a healthy level. This reduces the risk for atherosclerosis and strokes. As a source of vitamin C, carrots stimulates white blood cell activity, giving the immune system a boost. They can also help maintain a healthy blood sugar level due to the carotenoids that regulate the insulin and glucose in the body. They are therefore ideal for diabetics, and diabetes prevention. The fiber content of carrots aids the digestive system and can help with constipation and other digestive problems. Carrots have a sweet flavor that is mild enough to work in many different dishes. Its firm texture and elongated shape also allows it to hold well under different cooking methods. This means the possibilities are endless when it comes to including carrots in your diet. According to AllRecipes.com, carrots can be diced or cut into chunks and added into stew, shredded fresh and tossed with other vegetables for a healthy salad, cut into sticks and steamed or baked for a side dish or snack, even mashed and added to baked goods. Carrots can also be blended into smoothies or juiced. In preparing carrots, the peel must be removed, or else scrubbed clean of any dirt. Carrots can prevent several cancers, particularly lung, colon and breast, due to their high beta-carotene content. Carrots maintain eye health, and prevent vision diseases such as macular degeneration. The vegetable can protect against atherosclerosis, stroke, and heart attack. It can also regulate blood pressure and promote better circulation. The vitamin C in carrots boosts the immune system. Carrots can help diabetics by regulating blood sugar levels. Its fiber content keeps the digestive system healthy, and can help treat constipation.